(Lindholm) While the crowds inside the field house at UVM were cheering President Obama’s very presence, outside, some people were protesting what they say are promises the President has failed to live up to since taking office. (Pelletier) "For me it’s really foreign policy." (Lindholm) That’s UVM student Sam Pelletier. (Pelletier) "Obama’s done a lot of continuation of Bush policies and I think it’s up to the left in the Democratic Party and the youth to come out and talk about it. We need to demand that we get out of Afghanistan, that we don’t start another giant war in Iran and that we don’t need to be the policemen of the world. And that’s really where our money is being wasted." (Lindholm) Pelletier was among about 200 protesters who gathered on the street corner as the presidential motorcade passed by. He was not affiliated with any particular group, but many of the protesters were aligned with Occupy Vermont. Scott Chernoff, A Green Mountain College student and member of a group called Activisn @ GMC, thinks the protests made an impression. (Chernoff) "Rarely do you get to see your President, tell him something so directly to his face. Although he drove by for a moment, he looked directly at us. And we put some hard work into our banner here and he was looking straight at us and he saw what we had to say. That’s better than any phone call or email could have done. Our banner says ‘No War. No NDAA. 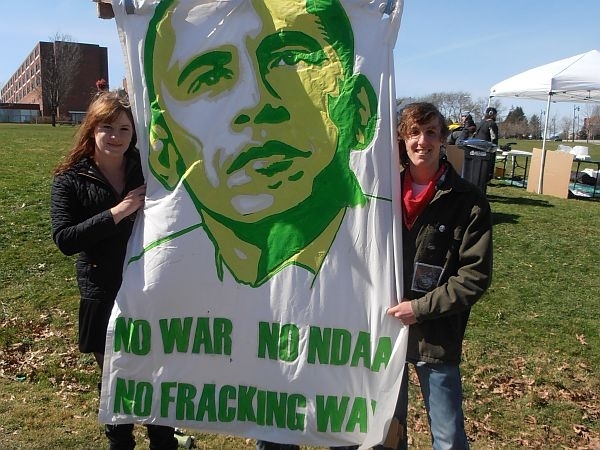 No Fracking Way.’"
(Lindholm) Officers with the Vermont Republican Party were also paying close attention to President Obama’s visit today. In his speech, the President used his signature message, highlighting changes he’s made in healthcare, women’s rights, the auto industry and student loans. (Obama) "Change is the fight we won to stop handing 60 billion dollars in taxpayer giveaways to the banks who were processing students loans. We decided let’s give those student loans directly to students, which meant we could make college more affordable to young people who need it. That’s what change is. That happened because of you." (Lindholm) Vermont Republican Chairman Jack Lindley thought that change was a negative one. Particularly for the Vermont Student Assistance Corporation, which had to make job cuts after changes were made to student loan distribution programs. (Lindley) "I think that VSAC was doing as good a job for the students in the state of Vermont and outside. Certainly my family used VSAC. I used it as a student way back when. It’s a fine organization and I don’t think that there was any reason to decimate that organization. And I don’t think that’s the kind of change that particularly is helpful to Vermont." (Lindholm) Lindley sees a clear divide between the President and whichever candidate eventually gets the Republican nomination. (Lindley) "Clearly the country has two paths to follow. One of a socialist, greek-styled government or one of smaller government, lower taxes, and a lot more freedom. And I think that will be debated fully in the campaign." (Lindholm) That may not be how Democrats choose to see the decision. But one thing everyone agreed upon today. "This is a defining election this next time. There’s no question about it."